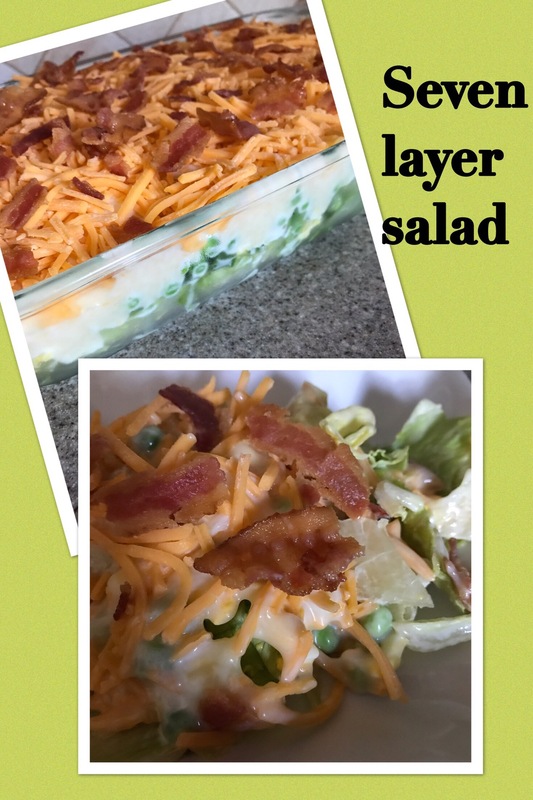 What’s more southern than a seven layer salad? Use the whole head of iceburg lettuce on the bottom, 4-6 chopped boiled eggs and a few little green onions. Then you place 12 oz frozen green peas on top. Now you mix 1/4 c sugar with 1 cup mayonnaise and place on top the peas. The fancy shredded cheddar cheese goes next and covers the whole salad. Put crisp bacon on top of the cheese just before serving. And if you are like most people, you can never have too much bacon! Sometimes to change this recipe up you can always add celery or red pepper. It might depend on the size bowl you use. If you add more vegetables just add more mayonnaise to adjust. You can count on having a lot of mayo and cheese if you’re in the south! This is so yummy…i used to make this all the time when my family was all around Circleville. I had sorta forgotten about this salad and after I came home from Spain I was craving it! Funny, huh?